No. Frankly it wasn’t helpful because I have full admin rights to Exchange. I have Public Folder rights to Exchange. I am the administrator. So no, as usual it wasn’t helpful. Alright, let’s get to fixing the issue of not being able to create a new public folder in Exchange 2007 even though you should apparently have rights to do so. First things first – I’m assuming you have at least Exchange 2007 SP1 which is when they included the Public Folder management snap-in. If you don’t – why not? Anyway, open up the Exchange Management Console –> Toolbox –> Public Folder Management Console. 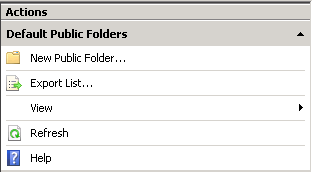 Expand Default Public Folders and click on that same folder. 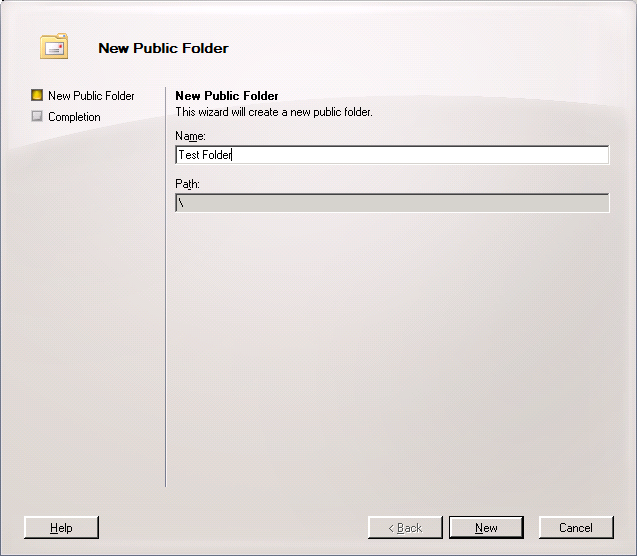 On the right hand column you’ll see the option to create a New Public Folder. Click it and give the folder a name – then click next. Now head on over to Outlook. 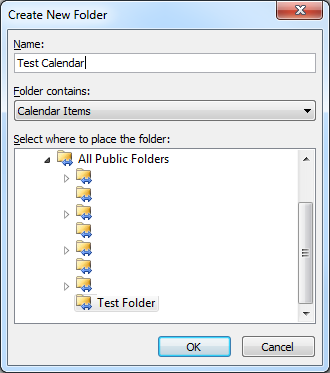 Expand Public Folders and your new Test Folder should be there. Right click on the folder and select New Folder. Change the drop down to Calendar Items and give it a name. Click Ok when you’re done. Wait… did you get the same error as at the top of the post? I did. Here’s why: If your domain is setup like mine you have a normal (mail enabled) user and an admin (not mail enabled) user account. When you created the Public Folder in the EMC it was most likely under the admin user account which now has owner permissions to the folder, but your lowly Outlook user account doesn’t. That little issue will keep you from doing anything worthwhile on the folder. Guess what? You can now go back to Outlook and not only create your Public Folder Calendar – but you can also add other user permissions to the folder/calendar.